The Lab slot isn't as you would imagine theme-wise, for example a zany Microgaming-style slot like Dr Watt's Up with cartoon monsters and images. If anything it more resembles a space game with crystals and a vortex behind the transparent reels along with futuristic sound effects and a gentle piece of synth-classical music playing in the background. There are similarities too in game play to their Champions Goal game in that only one symbol is needed to trigger the feature. Will the Lab trigger any reactions in you? There are, as is typical with Elk Studios' slots, symbols spaced to either appear double stacked or the same one can appear on both top the and bottom row of this 15 pay line 5 reel game. The only allusion to Laboratories is the fact the card icons are replaced by chemical elements and formulae such as H2O for water and Au for gold. While we are here with those they are the lowest-paying icons offering between 2 and 4x bet for a 5-of-a-kind win. The more valuable icons are various coloured crystals, the best being green at 67x bet, blue 33x, purple 14 and pink 7x stake for the full 5. You do have 2 'X' scatters appearing on reels 4 and 5 which multiply any wins in view by 2x for one, or 4x if both appear. There last symbol uses the game's icon on reel 2 - and it's important! If you remember I mentioned the vortex behind the reels at the start, this is actually behind the centre of reel 2. When The Lab icon lands over it, the whole 3x3 of the first three reels moves to the right of the slot and you get 10 free games with this whole block sticky on reels 3, 4 and 5. The Lab now becomes a 2x Wild and the first two reels spin. Now due to having 15 win lines where this now is on the centre of reel 4 it can only appear in 9 of those 15. 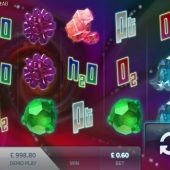 The second point to note is that if the symbols exported across from reels 1 to 3 with it are poor then your free spins are effectively doomed from the off and wins limited to low-paying 4-of-a-kinds for example. You do get extra spin icons +1 or +2 landing on the first 2 reels though in these games.